Everyone feels stressed out from time to time. The leading causes of Americans? 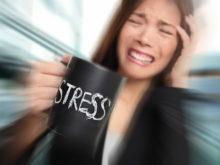 stress include finances, work, family responsibilities, and health issues. Constant stress can lead to worry or anxiety. In people with anxiety disorders, the worry is constant, and detrimental. Worry and anxiety can become so severe that a person is no longer able to go to work or function in his or her day-to-day life. This phenomenon is sometimes called a nervous breakdown. It?s not a real medical term, but rather a description of symptoms. The inability to function is serious, and it requires help from a mental health provider.